11 oz. 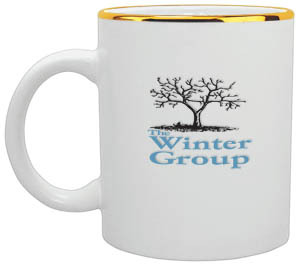 White Ceramic Mug - Gold cap bands and halos are optional. Desc: 11 OZ PROMO CERAMIC MUG. Weight of Case: 34.000 lb. Please note: Fast Glass available with one color imprint only! Precious metal bands are not available when ordering the 2 day Fast Glass Service.